The 35th International Conference on the FCPA took place in late November of last year. Partners Jen Baskin and Drew Costello, Directors Masakao Asaka and Mike Trahar, Associate Director Danielle Loque, and Manager Matt Bedan attended. This year’s conference focused on updates and changes to aspects of the FCPA, what to expect in the upcoming year, and hosted sessions on specific industries, including Life Sciences. Below, FRA Partners and Directors share key insights from the conference’s opening session with the DOJ and SEC. Established on 29 November 2017, the policy provides incentives to companies that self-disclose, cooperate and remediate. One of those incentives, declination, offers the possibility of a significant reduction in sentencing guidelines. If a criminal resolution is warranted and absent aggravating circumstances, companies that voluntarily self-disclose, fully cooperate, and remediate in a timely manner can receive a 50% reduction from sentencing guidelines. Those that do not self-disclose, but still cooperate and remediate can see up to a 25% reduction. The DOJ shared that they have yet to see a company that has met all of the hallmarks and not received a declination. When asked why the SEC has not joined the policy, SEC panelists shared that the SEC approach and mission differs from the DOJ. While the DOJ’s mission is criminal resolution, the SEC has a wider scope. While they do not have an official policy, the SEC does consider the aforementioned factors and has issued declinations without a formal policy. When looking at enforcement, both the SEC and DOJ have groups dedicated to FCPA violations. The DOJ has more than 30 prosecutors dedicated to FCPA enforcement full-time, including three new FBI squads of special agents. The SEC has roughly three dozen staff dedicating their time to FCPA enforcement. While the case load remains steady, both the SEC and DOJ clarify that having more dedicated staff does not indicate an uptick in enforcement, but rather a focus on approach. At the time of the conference, it was estimated that 2018 would close with monetary sanctions in excess of two billion dollars imposed. Assistant Attorney General Brian Benczkowski released a memorandum in October 2018 on selecting and appointing monitors. Most notably, it requires candidates to disclose interest and provides detailed factors for the DOJ to evaluate. During the panel discussion, members from both the DOJ and SEC were able to comment. Members from the DOJ shared that the requirement for candidates to disclose interest was not a major deviation from previous requirements. As an example, the DOJ proposed a hypothetical situation in which a monitor candidate could be accused of trying to gain favor with the DOJ by encouraging the client to plea with the DOJ in order to be selected as a monitor. This type of disclosure hedges that risk and increases transparency. Members from the SEC shared that while they haven’t adopted the DOJ’s Corporate Monitor Policy, they have something similar in place. Since the SEC does not select the monitor, they do not have Sixth Amendment issues. For SEC imposed monitorships, the company makes their selection from three candidates, as long as the candidates prove to be of standard. The panel closed with a note on records retention and a Q&A session. Under the DOJ policy, to receive full credit for cooperation, companies must prohibit the “improper destruction or deletion of business records, including software that generates but does not appropriately retain business records or communications.” Both the SEC and DOJ encouraged companies using messaging apps for business activities to consider the risk and rationale for use. Messaging apps that have short or no retention may be reasonable for certain business activities but should be avoided for high risk business activities or for making important decisions. During the Q&A session the DOJ shared that they have no intention to hire another compliance consultant to succeed Hui Chen. Rather, their goal is to build compliance expertise within the Fraud Section by educating trial attorneys and hiring attorneys with compliance experience. 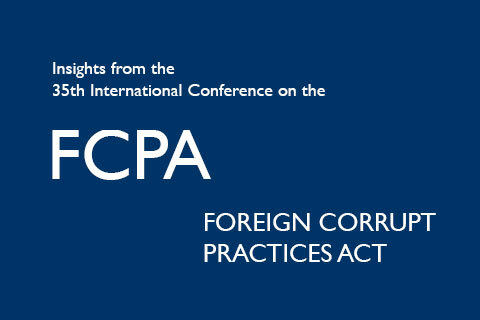 For more on the 35th International Conference on the FCPA, visit their website.